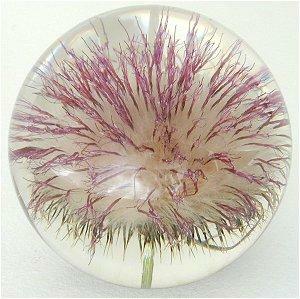 Hafod Grange has been producing paperweights for a little over 30 years. Situated in the middle of Margam Forest, high in the mountains overlooking Swansea Bay in South Wales, Hafod Grange used to be the summer grazing area for stock kept by the Cistercian monks of the now ruined Margam Abbey. The paperweights are now produced in the workshops sited in the 14th Century tithe barn which has been renovated by the company. Even today, the Grange is the home for grazing deer, horses and other small wildlife, with birds in abundance. The original paperweights were first produced in 1968 by Barry Needham as a form of therapy for muscular dystrophy. 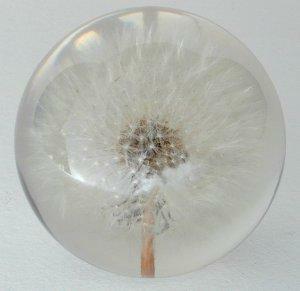 One day a friend challenged him to encapsulate a 'dandelion clock'. Barry met this challenge head on and after numerous attempts and with meticulous patience he finally succeeded to everyone's amazement. After his death the designs were refined by his brother, Alan Needham, into the products that we offer today. 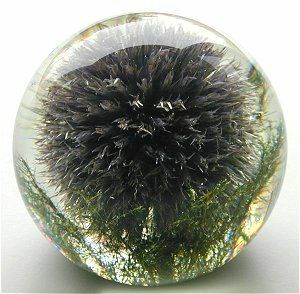 When Alan Needham started producing the paperweights on a commercial basis, his objective was 'to create the unusual, bordering on the impossible'. 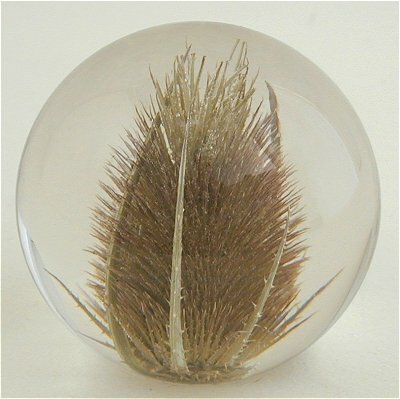 Clear polyester resin, containing a UV filter to stop fading, is used to embed the botanical specimens without destroying them, as molten glass would, and the globe shape allows the specimen to be seen in its beauty from all angles, creating a crystal clear effect. Considering what a pest these plants are here in Colorado I am almost anxious having it sitting out on my desk. Imprisoned it is and truly beautiful in its structure so I will get used to it in time. As a gardener the dandelions have always been a pest moving in where unwanted but contained here for eternity they are really quite beautiful. As a gardener the dandelions have always been a pest moving in where unwanted but contained here for eternity they are really quite beautiful (only have 1 left).